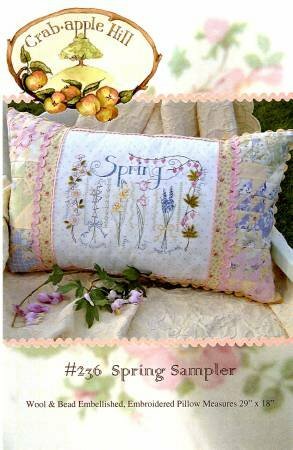 Join Jennifer to make Crab-apple Hill's Spring Sampler, featuring lovely spring blossoms. This is a beginning embroidery class and the project is also embellished with wool leaves and beading. (Jennifer will give you ideas for finishing the sampler, but the patchwork borders will not be done in class.) Second Thursday, Apr 11, May 9, Jun 13, 5:30 - 8:30 p.m. Jennifer Adams, $60 for three sessions, supply list. (Students must purchase pattern and kit [wool and beads]).